Kultopia is the product of the collaborative workings of Amanda Airs, Shelley Grayden and Jack Rowland as mediated by the curator Adriane Hayward. Kultopia manipluates the artist/curator relationship; and communication, trust, authencity and automony will be tested. Collaboration extends creative practice and collective play, ultimately resulting in new exchanges. Kultopia is an immersive constructed environment. Abstracted detritus collected from the urban environment and references to the natural landscape are transformed in the gallery space. This artificial reconfiguration of everyday objects aims to create a kind of spatial simulacrum of reality. Art and space meld together in a sensory overload of objects and imagery. 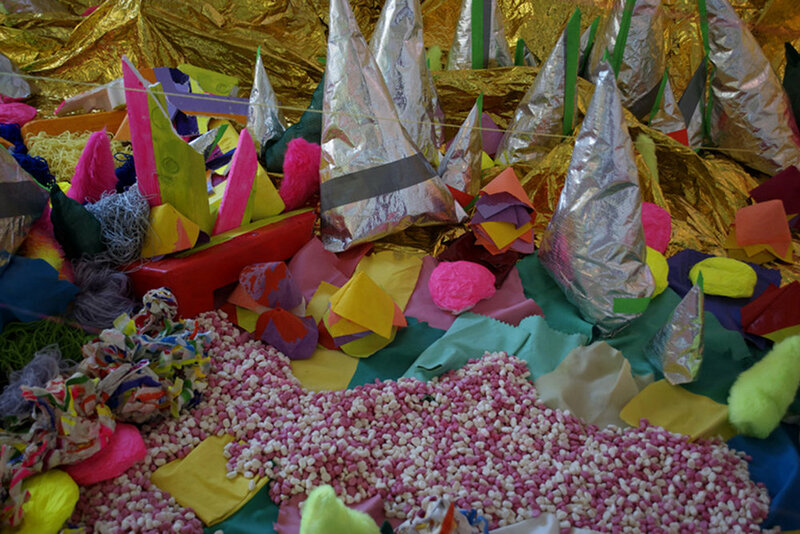 Kultopia is the product of the collaborative workings of Amanda Airs, Grayden Shelley and Jack Rowland as mediated by the curator Adriane Hayward. The outcome of the project is both a site-specific installation and the methodology of creating the site-specific installation that investigates artistic relationships, authorship and the paradigm of the sole creator. Methodology and outcome are linked by ideas surrounding abstraction of space and artificial environments. A collective recognition of a broad framework for construction and a push for certain colours, mediums and materials were the only preconceived ideas about the work. One thing that was certain was the process: artists would be asked to relinquish their individual art practices and respond to a set premise and the direction of the curator. The processes that normally occur before installation – namely the construction of the work – have instead occurred during it. Artists were asked to bring elements of their own practice with them to the gallery. The formation of the work was to be directed in the space itself with the curator directly involved in the collaborative process as a mediator and active participant. This project will question if collaboration can be successful in formulating new ways forward in cultural production; and map the framework for this to occur. Kultopia is intended to be an elevation of artistic practice through collaboration and exchange resulting in an outcome that is open-ended and intentionally unknown. Kultopia manipluates the artist/curator relationship; and communication, trust, authencity and automony will be tested. Collaboration extends creative practice and collective play, ultimately resulting in new exchanges. A multitude of actively engaged personas leads to the development of work that is diverse, pluralistic and heterogeneous. Artists must relearn expected individualistic ways of working and relinquish control; here the art paradigm may not always need to exist within the actions of the individual artist. Collaboration is a perpetually a significant mode of cultural production as it provides a point of difference in an increasingly individualistic society. These three particular artists employ multi-disciplinary practices in painting, installation and sculpture, and they have been brought together because of a shared understanding of colour and space. In her individual practice, Amanda Airs explores the extension of painting in space through installation. Fabricated materials such as nylon thread and synthetic wool are arranged and suspended in space and are used to mimic formal qualities present in flat abstract painting. 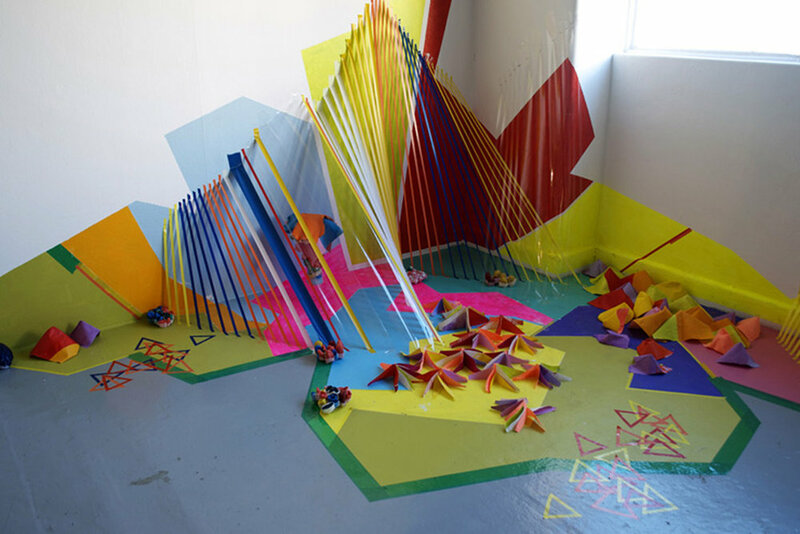 Grayden Shelley explores installation based practice, utilizing perception and ornamentation within the history of painting and sculpture, Shelley morphs specific sites to create contemporary spatial installations. Jack Rowland offers a new consideration of the seemingly familiar rural Victorian landscape by challenging traditional realist painting with the use of unnatural oversaturated colour themes and psychedelica. Kultopia is an immersive constructed environment. Abstracted detritus collected from the urban environment and references to the natural landscape are transformed in the gallery space. This artificial reconfiguration of everyday objects aims to create a kind of spatial simulacrum of reality. Art and space meld together in a sensory overload of objects and imagery, the viewer must navigate through these spatial constructions to fully experience the work. The creation of an alternate kult or kulture utopia encourages reuse of discarded materials and questions how these altered objects are different to the collectied detrius they orginally were.